Digital Auto Space is the new iPad app for Volkswagen customers to explore its world. The world’s largest automaker introduced DAS the interactive iPad app in iPad magazine. 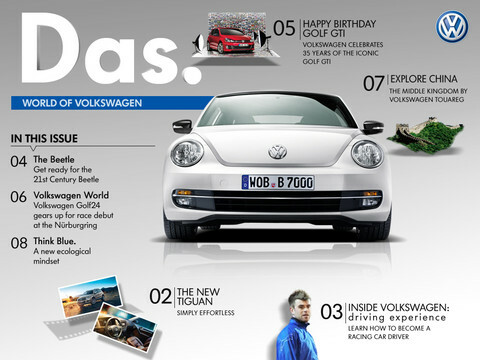 A magazine that focuses on the Volkswagen lifestyle with related stories, product videos and full scope 360 degree car views, is published quarterly in six languages. 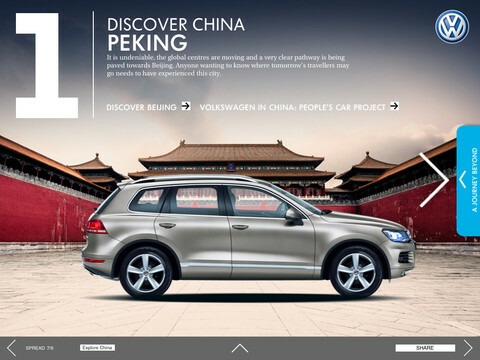 Volkswagen considers Volkswagen iPad App DAS as an important stepping stone in their online and digital marketing plan. The strategy opens an opportunity for customer interaction through open dialog with the company. An innovative goal in transmitting brand news and product releases digitally for an encompassing global experience Volkswagen Passenger Cars head Luca de Meo explained in reference to the iPad launch app. While Volkswagen may not be the first company to integrate iPad technology with Volkswagen iPad App, it is certainly the biggest. German maker Mercedes-Benz and the Volkswagen subsidiary Audi have announced upcoming iPad linked technologies over the past month. The Korean based Hyundai is planning the addition of an iPad with an Equus luxury sedan purchase. In high response to ditching paper manuals, Hyundai decided to use an interactive app with the iPad for customers. Volkswagen used the strategy of timing with the iPad’s premiere launch in European countries. The Apple App Store carries the new free Volkswagen DAS iPad app along with free upgrades on newer products and features. Volkswagen is also promoting its new Up vehicle for the iPad and iPhone applications that puts consumers in the driving seat. The app was debuted in Spain, France, Germany, Italy, Britain and the USA to let race car fans learn more about the new model through virtual interaction. The Up car is an efficient vehicle geared towards younger customers with quirky slogans and interactive features. Customers can use the app as a hands-on experience of the Volkswagen car via an interactive racing game letting them test the cars best features and new perks. Users start by choosing one of six racing colors. 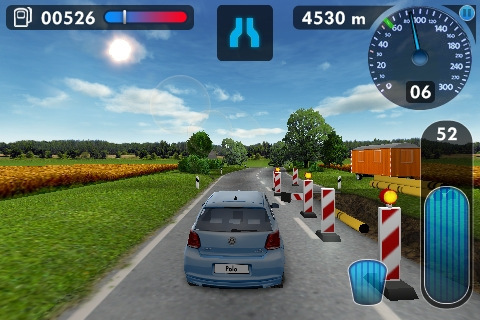 It is a multiplayer app so drivers can race around the track with friends. Interaction takes place one in three ways: direct interaction with the cars, engaging in several challenge games with other models like Tourareg or Sciroco editions, or exploring an optimized mobile landing page. Additionally, drivers are able to learn about the vehicles simply by swiping across the touch screen. Multiple angles can be explored and then go to finishing point at a mobile site. Volkswagen decided to use this strategy with the success of 2 million downloads with the Real Racing GTI iPhone app and its outreach to newer buyers that are tech oriented and geared towards social media trends. The company plans on making more apps for upcoming models with similar test driving functions virtually, letting drivers experience the number one automaker’s cars as performance vehicles. The new launches Volkswagen iPad App combined with DAS have shown the growth and direction that Volkswagen has merged with its superior marketing strategies over the long course of its livelihood, in hopes to appeal to a newer and more social media oriented consumer. If you know some Best Free iPad Apps and Games for iPad then you can share with us via comments below. Should You Hold on to Nokia X7?